Robert Blouin knows his parents and grandparents weren't as active as he is at age 67. "They were on the couch or in the rocking chair,'' Blouin said. "Not very mobile." Not Blouin and his fellow seniors at the William J. "Red" Vickrey Resource Center on Friday. 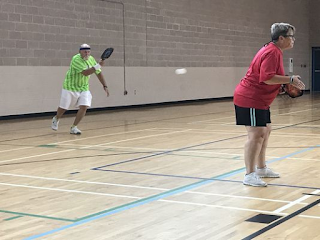 Dozens of folks ages 50 and older took to the hard courts for a pickle ball tournament — part of the Pensacola Senior Games, which run through Sept. 24. Minutes later, Blouin was on the court at the Vickrey Center swatting the pickle ball — think wiffle ball — with his paddle, which resembles an over-sized table tennis paddle.